If you were along for the seven-year wild ride of Pretty Little Liars, then you've probably seen enough onscreen murders, questionable dating choices, and far too many people in hooded trench coats and doll masks to last you a lifetime. But I have some news: you're about to get sucked right back in. 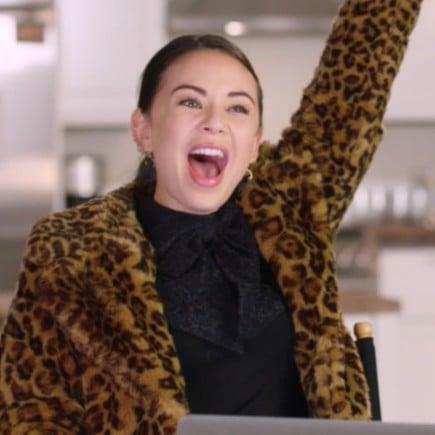 Clear your schedule March 20, and grab a bottle of wine, your best friends, and the nearest couch, because the epic series' spinoff, Pretty Little Liars: The Perfectionists, is almost here. And from one PLL-obsessed watcher to the next: it's really damn good. In celebration of the new show, we've featured the Perfectionists cast in POPSUGAR's first-ever digital cover story. In addition to capturing truly epic photos and their social media secrets, we sat down with PLL originals Sasha Pieterse and Janel Parrish on set to test how well they remember the series - in which they go back in time to think about everything from first kisses . . .
. . . to passwords. Check out the full video above to see just how much they remember, and catch the all-new series, Pretty Little Liars: The Perfectionists, when it premieres Wednesday, March 20, on Freeform!